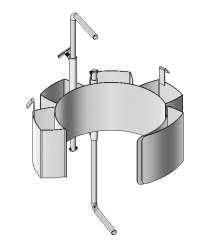 for handling a smaller drum are available for various smaller drums. Choose the correct size Diameter Adaptor for your drum. 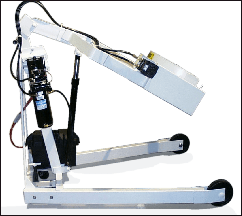 Morse Stainless Steel Hydra-Lift Drum Karriers for controlled dispensing of your drum. 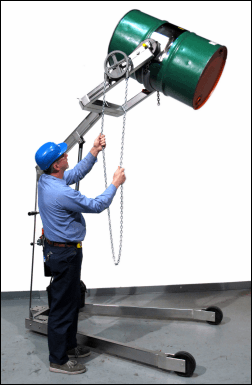 High quality stainless steel drum handlers for use in the clean environments, such as food and pharmaceutical companies Model 400A-96SS-125 shown has 8 foot (2.44 m) maximum pour height, battery power lift and pull chain tilt control. 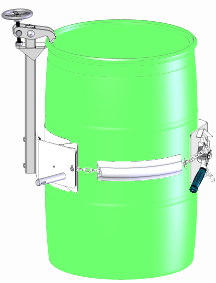 Rotate drum 3600 in either direction. 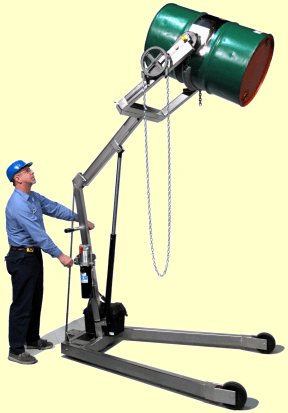 Morse Hydra-Lift Drum Karriers combine incredible strength with simple drum handling by one person. 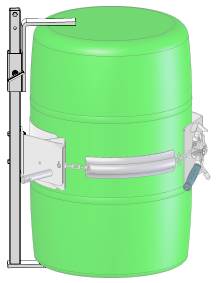 Note: Maximum of 40" (102 cm) tall drum can be rotated. Morse stainless steel drum carriers have a frame made of finished type 304 stainless steel. The welds are NOT ground smooth or polished. Some purchased parts are NOT stainless steel, such as the ratchet, pawl, wheels, casters, motor and hydraulics. 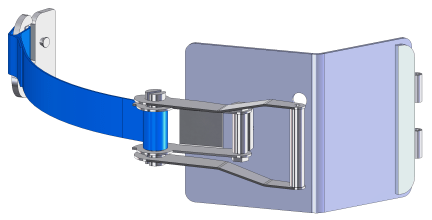 Gears and sprockets are NOT stainless, but are covered with stainless steel guards. Options for all stainless steel gears, sprockets, pawl and ratchet are available. 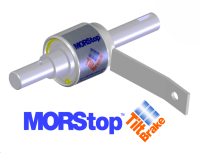 MORStop Tilt-Brake option with manual tilt models to automatically prevent uncontrolled drum tilting. 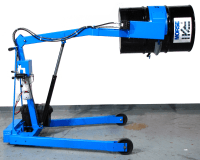 Stainless steel hydraulic drum dumper on wheels to lift, move and pour drum. 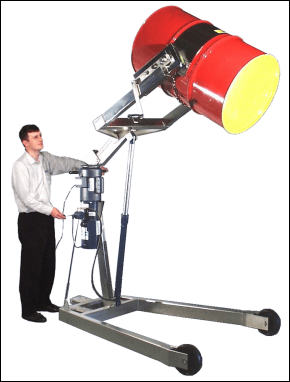 Morse stainless steel hydra-lift drum dumpers provide controlled dispensing of your drum. Stainless steel hydraulic drum dumpers.